The ProForm 150i is one of the elliptical trainers released by the ICON brand in 2016. It’s a mid-range trainer made for home use, available at an acceptable price. In terms of features, it can be compared to the AFG 2.5AE or the Universal E40. For reference, this is the ProForm model PFEL02916. 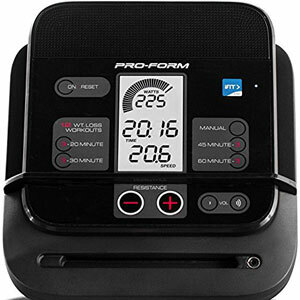 As we’ve mentioned above, the ProForm 150i is a fitness machine designed for home use. This being said, it doesn’t have the size and sturdiness of a gym-grade elliptical, but it’s definitely a sturdy machine. Most of its frame is built of durable steel tubing; the only parts in its construction made of ABS material are the pedals and the flywheel covers. The unit is designed to support users up to 250 lbs (113.3 kg). All the steel parts of the frame are coated with a rust-resistant and abrasion-resistant paint, with the exception of the rear base bar which has a chrome finish. The machine’s frame is divided into two main parts, the rear part with the rails of the pedals, and the front part with the motor, flywheel and the console mast. The two pain parts connect at the middle and they’re fixed together via several screws. This being said, the box is not extremely large. However, the whole unit is considerably heavy. It weighs over 120 lbs and it’s recommended to be transported and assembled by two persons. 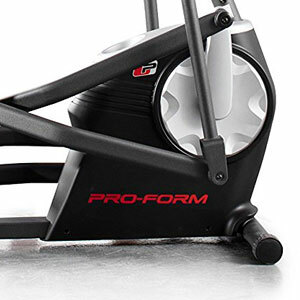 Like most elliptical trainers, the ProForm 150i features a rather large construction. With the frame fully assembled, it is approx. 63″ (160 cm) long, and 26″ (66 cm) wide. On top of these dimensions, it is recommended to leave at least two feet of clearance all around the unit, for easy access and operation. Considering its 120+ lbs of weight, this trainer is quite stable. On top of that, its rear base features adjustable stabilizers which allow you to perfectly level it on any type of flooring. The front base is equipped with rotating caps which can act as transport wheels if you need to relocate the unit. However, it doesn’t have a folding design. Since it’s one of the less inclusive ProForm elliptical trainers, the 150i doesn’t have any extra pedal cushioning or articulation. The pedals are pretty standard, made of durable ABS material. They have an anti-slip surface and an inner/front border to provide extra foot stability. They’re large enough to accommodate athletic shoes of all sizes. The pedal bars are equipped with heavy-duty wheels. They integrate industrial-grade ball bearing and deliver a smooth and quiet motion over their rails. The joints between the handlebars, pedals, and cranks are also equipped with small ball bearings. In case you’re wondering, the machine’s step-up height is approx. 12″ (30 cm). Also, at their highest position, the pedals raise at approx. 20″ (51 cm) above floor level. Therefore, it’s recommended to assemble and use the machine in a room with a ceiling that is at least 22″ – 23″ (56 – 58 cm) higher than your own height. One last aspect to mention here regards the units handlebars. 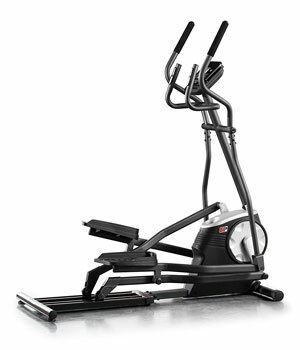 The ProForm 150i elliptical trainer features two sets of handlebars, one mobile and one fixed. The mobile handlebars have standard grips; their top reaches approx. 67″ (170 cm) above floor level. They’re equipped with rubberized grips for a comfortable contact with the hands. The stationary handlebars feature the same rubber-foam grips. They integrate EKG pulse sensors, so if you hold on to them when exercising, the console can monitor your heart rate. 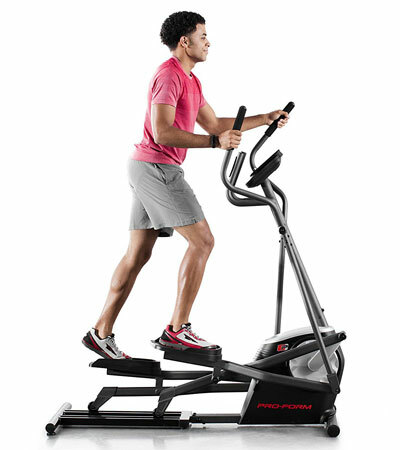 The ProForm 150i elliptical machine is equipped with an eddy current resistance system. It consists of a small motor and a magnetic brake. The resistance can only be controlled from the console which can be powered by four D-type batteries, or via a 110-220V input, 6V 2A output adapter. The adapter is not included. As you adjust the resistance, the unit’s motor will change the position of the magnetic brake in relation to the flywheel. This increases or decreases the intensity of the magnetic field and results in more or less pedal tension. Evidently, the brake element doesn’t come in contact with the flywheel; thus, there is no friction, the wear and tear of the brake elements is almost inexistent, and the operation of the machine generates very little noise during operation. There are 12 distinct resistance levels available. The first 1-3 levels provide a very light resistance, great for recovery training, or for users with disabilities. Conversely, the top 11-12 resistance settings provide enough resistance to give you the possibility to break a sweat, improve stamina, and tone leg muscles. ProForm doesn’t provide too much information with regards to the drive elements of the 150i elliptical. To begin with, the weight of the flywheel isn’t specified, but it is an inertia-enhanced flywheel, which means that it has most of its weight in its perimeter, in order to provide a more consistent momentum. 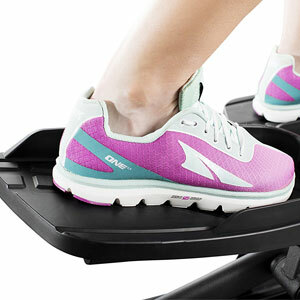 The pedaling motion is also very smooth and steady. The machine allows reverse pedaling. This way, you can put quite some diversity into your workouts. Also, if you decide to pedal in reverse, the console will continue to measure your workout metrics. Like most other elliptical trainers with a magnetic resistance system, the 150i uses a belt drive system. It integrates a durable, stretch-resistant, poly-v rubber belt. As opposed to a chain drive, a belt doesn’t require lubrication. It also generates less vibration during usage. The trainer’s Q-Factor (spacing between the pedals) is only a few inches. This means your feet are naturally positioned on the pedals, and the pedaling motion doesn’t generate any extra stress on the knees or ankles. In fact, a workout on this elliptical trainer generates considerably less stress than a run on a treadmill. The ProForm 150i is equipped with a mid-range console. As we’ve mentioned above, it can be powered via four D batteries or AC adapter (the adapter and batteries are not included). It has a sleep mode to which will enter after 30 sec. of inactivity on the unit, which is quite useful if you opt for batteries as a power source. The unit features an LCD display with backlight. The display is divided into three main sections. The top section alternates three values, which are the resistance level, RPM, and BPM (heart rate – beats per minute). The RPM meter also has a bar representation which will increase or decrease as you change your pedaling speed. The center section shows the elapsed time and distance. The bottom section shows the calories burned and speed. The unit allows you to set up goals for time, distance, and calories. If you select a countdown value for any of these metrics, the display will show the remaining time, calories, or distance until it reaches zero. For speed and distance, you can select both metric or imperial units. The console can monitor your heart rate through the integrated sensors, but it is also Bluetooth enabled. This means it can read your pulse via an HR chest strap transmitter, but this accessory is not included with the trainer. The console has 12 preset programs. They are divided into four categories, for 20, 30, 45, and 60 minutes. Some of the programs require you to change your pedaling speed repeatedly for their duration, while others will automatically adjust the pedal resistance. iFit connectivity is also available with this type of console. Differently put, it gives you the possibility to sync it with a tablet or smartphone that has the iFit app via Bluetooth, and stream your workout data into your iFit account. This way, you can easily keep track of your progress. However, an iFit membership is not included with the machine. Two other notable non-fitness features of this console that we must mention here are the sound system and the tablet holder. The sound system consists of two small speakers placed at the top of the unit. It is compatible with most MP3 players, smartphones, or tablets. It has an audio jack and volume controls, while the sound rendered by it is superior to the speakers of most smartphones or tablets. The tablet holder is placed under the main display. It can serve as a shelf for most tablets. However, a tablet placed on it will cover the unit’s display. The unit’s resistance system and drive elements come partially assembled. However, there still are many parts that require assembly. Thus, the task may take more than an hour, but the included manual provides very clear step-by-step assembly instructions. You will basically have to connect the two pieces of the machine together, attach the base bars, the pedals, the handlebars, the console, mast, and the console. Some of the tools required for the assembled are included, but you will also need a Phillips screwdriver. For maintenance, it’s recommended to periodically inspect the machine for loose bolts and parts. Especially the rails of the unit require periodic cleaning, to avoid any damage to the wheels. Also, the machine’s joints may need lubrication after a while. The ProForm 150i is an elliptical trainer designed for home use. It’s equipped with an eddy current resistance system which offers 12 resistance levels. Its console is Bluetooth enabled and iFit compatible, also offering 12 preset workout programs. 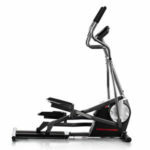 It’s a great machine for muscle toning, stamina development, interval training, weight loss, and in general, light to medium-range cardio workouts. In all, it’s a trainer available at an excellent price/quality ratio.